The trees in this area have been marked by a forester in anticipation of an improvement harvest. The objective is to remove low-grade/no-growth trees and to improve the growing conditions for the remaining crop trees. A previous thinning was completed in this area in 1992. A pair of sugar maple trees, also known as sap maple, rock maple or hard maple. You are standing on an old "scoot" trail. It was once used to haul logs out of the forest on a scoot (sled) pulled by horses or oxen. The runner marks can still be seen in the ground. Circa 1940. Crossing a seasonal brook on an old logging trail. Note the placement of stones in the brook to support the animals and their load. Current harvesting laws would require that a bridge structure be built here. Large, mature white ash tree, 24" in diameter. The dead white pine next to it probably died from lack of sunlight. Ash is commonly used for furniture, paneling, axe handles, and baskets. A pile of stones is evidence that this land was once agricultural land. Also nearby is a good quality white birch tree. Beech trees like this are commonly left in the woods, even after repeated harvesting. This is because of the poor tree form, low value, and danger of felling. This tree has ice damage and beech bark disease. Chances are the tree has rot. Beech has excellent wildlife value, providing mast (Beech nuts) and cavity/den opportunities to a wide variety of insects and animals. Northern red oak tree. 10 feet in circumference at breast height. Highly desired species for lumber production. Also a good wildlife mast food producer (acorns). The trunk of this tree weighs the equivalent of several automobiles. A felled white pine tree (1940's) that was never removed. A few other large pines in this area were never cut even though they would have been large enough for harvest at the time. There are also several "hurricane" trees here that were tipped over during one of the hurricanes of the 1930's. Thus, this area may have been subject to some salvage in the early to mid-1940's. An older hardwood stand. Mostly beech. You are now at the highest elevation of the walk, approximately 1,000 feet above sea level. There is mixed ice damage in the vicinity; some trees have heavy damage, while other trees have little to no damage. This stonewall is running north/south. The magnetic bearing of the wall (the bearing changes over time) was N 7 W or S 7 E as of October 1989. The wall was built as a pasture, field, or hay meadow boundary c. 1850. Intersection of snowmobile/hiking trail to the top of Chandler Mink (and the old tower). The trail is normally maintained and marked. Going south (downhill) will continue the woods tour and return you to the ski area/parking lot. Crossing a stonewall that was perhaps once a boundary wall as evidenced by an old axe blaze in this maple tree. A high water table, combined with shallow roots of these poplar trees caused them to blow over in a high wind (1989). Because of the low value of poplar and the few number of trees involved, these stems were never salvaged. The big pine trees in this area may have been left standing at the time of the last harvest as "seed trees" so that pine seedlings would grow back. Pine did not reestablish however and the hardwoods took over. This brook runs out of the Mink Hills and feeds the Town recreation pond area on North Village Road (was the Warner Village Fire District pond). The amount of flow varies greatly according to the season and amount of precipitation. There is a wide diversity of trees species within a small radius of this area. Found are: yellow birch, white birch, white ash, sugar maple, red maple, striped maple, red oak, beech, basswood, hornbeam, red spruce, pine and hemlock. Maps: Shown below is a map to guide you to the trailhead parking. There is a map available at the Selectmen's or Town Clerk's offices showing all of the trails on the Chandler Reservation. A downloadable copy of that map is available by clicking here. 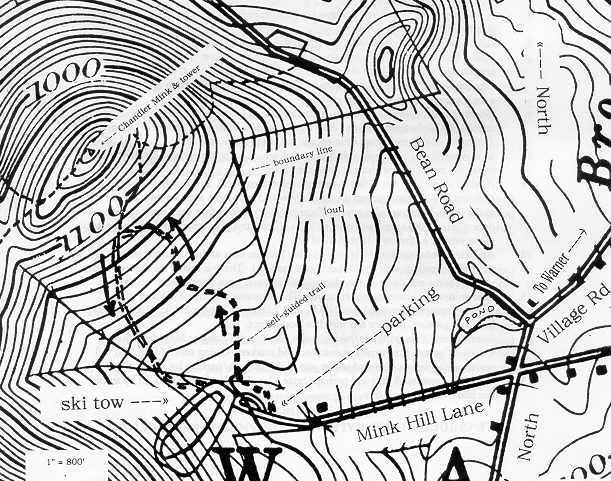 Also, a full scale 1"=800' topographic map showing the boundaries of the Chandler Reservation is available at those offices.